Honor Roll Member – Swearingen, Wayne Elwyn « Perry High School Alumni Association, Inc.
Wayne began his illustrious 60-year career in the oil industry as a roustabout after working during his PHS senior year at the Perry Daily Journal. Following his military service in WWII, he obtained his degree in petroleum engineering from OU. He began a six-year stint with AMOCO, and then joined Livingston Oil Company, within five years becoming LVO’s President and CEO. He was considered a “visionary” for eventually expanding the business to include cable television and business services. He also found time to complete the advanced management pro-gram at the Harvard Graduate School of Business Administration in 1965. 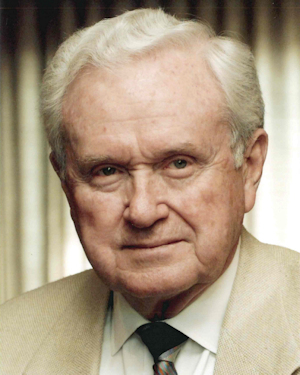 A widely respected and sought-after spokesman for the oil industry for decades, Swearingen became President of Swearingen Petroleum Company at the age of 72. As founder of the International Association of Energy Advocates, he was an advocate for the industry, as well as media spokesman and popular speaker who was often quoted by national media. He often spoke about the need to protect the environment, grow the economy and provide adequate and affordable energy. Swearingen said he married the “prettiest girl in Perry,” the former Dorothy Wilde (Class of ‘43), and was quoted in one of many articles about him as saying “Perry was, and still is, a good town for growing up.” He is survived by Dorothy, two sons, Scott and Brett, and daughter Lynn Bockmeulen.